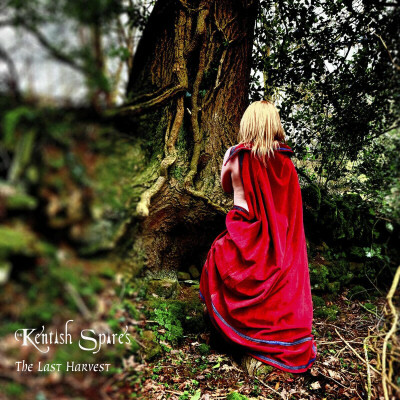 The KENTISH SPIRES: "The Last Harvest"
Your album is entitled 'The Last Harvest' can you explain the meaning behind this? ‘I wanted this to be a complete collaboration where someone would come in with an initial idea and the rest of the band would then flesh out the rest of the song. As a producer you are normally suggesting things for other members to play or sing but I intentionally sat back and allowed each player to add their parts with no restrictions allowing the songs to speak to them as individuals and let them express how ever they wanted to. We would start with a demo of the song which would be recorded with a click track I would then work with Tim Robinson the drummer who would construct his parts and then record them. It’s important for me to get the energy of the song first which comes from the drums to then give the rest of the band the basis for them to do their performances. We never file swap as I want to record the basis of the album in the same environment and have the band all in the room. The only time I recorded elsewhere was when I went to Paul Hornsbys private studio to record a couple of wind overdubs. What inspired you to compose several tracks about Kent and its ancient history. When my family moved from Cliffe to Bexley in Kent I lived across the road from bassist Phil Warren. We were in our third year of senior school, Phil loved history and was a master of war games. He was very keen to write about the formation of Kent and how it was abandoned by the Romans and the importance of Hengist which Phil will go to great lengths to explain. The inclusion of those songs on the album leads the audience to our part of the country and to celebrate a genre of music that was short lived. You're not supposed to feel uplifted by the lyrics of The Last Harvest? What's it all about? The Last Harvest is a kind of post apocalyptic tale where as humans we have taken everything from mother earth and put nothing back, so this is literary the very last harvest before earth refuses to grow any more food. Its also our acceptance of it. Lucie V delivers a vocal that is melancholic in the early part of the song with the last verses giving way to her anger and frustration and finally her muted wails of acceptance. The long play out leads to Riks haunting lone organ reminiscent of those old church harvest festival of my youth. As a producer it is important to run the session, judge the energy of the room, if a player is struggling to find fresh ideas, stop and move on to something else. Sometimes I will clear the studio so that I am just working one to one as an audience of band members can often hinder a performance. Having a lot of patience is paramount as I never want the musician to think he or she is boring or irritating me as they try to find their perfect performance. The studio should always be a safe and inspirational place to be and as a producer you will know when they hit the one. I always mix alone. It is so dangerous to have a committee of band members wanting their parts louder as they are emotionally connected to their individual parts where as the producer will have an overview of how the song is presented to the all important record buying public. It’s never about the technology for me. It’s so easy to get caught up in all the latest plugin processors and musicians love to talk gear but sometimes we forget what a real guitar or saxophone sounds like and the power of the recording can sometimes sound more powerful as you start removing pedals and plugins. I like to mix dynamically, meaning that when ever an instrument is making a statement or an interesting phrase I will push the level. Solos will be high in the mix as I want to direct the listener there. I want to hear the lyrics of the song but with the power of the band wrapped around them. This balance is critical, push the vocals too high and you detach them from the band. Fortunately with Lucie V her diction and pronunciation are so good that wherever her vocals are in the mix you can still hear every word. Always have good food in the sessions and always keep a positive energy. Understanding the balance of art and economy. Lastly, I think it is important to go to a studio to record rather than each individual members recording on their home set up and sending it on. Recording an album should be an occasion, an exciting event where the collaboration of ideas can lead to happy accidents that never would of happened unless they had all been in the same room. The other problem with some home alone recordists is that they can sometimes get caught up in never knowing when they have a great performance with some interesting imperfections, so they continue until they wring every last piece of originality out of it. It was important to find a sound palette that would be different to what’s out there at the moment. I always loved the way Gentle Giant and Van der Graaf used wind instruments. One of my favourite albums was The Snow Goose by Camel and their use of string quartets with brass and winds. We have heard so many virtuoso guitarists and keyboardists that it’s so hard to express anything different that hasn’t already been said. It was a conscience decision to step out of the mould. As my partner Helen Williams and myself compose music for film and television, our studio is set up for our own productions and artiste clients, so it is a fully professional studio.. The Piggery Studio is built on a former piggery where we have a good sized live room and large mix room. The desk is an ASP 8024 analogue desk recording onto an old G5 via Logic X with Apogee converters. My choice of monitoring is a pair of Dynaudio M1 and a Genelec 5.1 system for our movie work. We have some old valve outboard including a Vac Rac 4000. So you could say that we combine the two. What kind of input did friends and fellow musicians have during the process? The whole band influenced the final cut with ideas but we all knew what our goal and brief was and we stuck to it which is why the album has musical continuity. We would not be influenced by friends opinions as friends very rarely buy your music. We wanted to make the music that we loved and hoped that a similar musical community would like it and support us by buying the album. Are you all massive fanatics of 70s prog, production, and sound? Yes we are. Four members are of the age where we remember the great prog bands the first time round. Prog was important to me as a 15 year old when I was first starting out as a player. I was in a band called Korig Roots and supported Quintessence, Pink Fairies and one of my favourites, Patto. Lucie V who is much younger comes from a musical family and was brouht up listening to Pink Floyd and early folk music. Mike Stock was a year above us when Phil Warren and myself were at Swanley Comp school and Phil went on to play in a function band with Mike. Prior to that Phil, Barry Purkis aka Thunderstick and myself played in a school band together playing the youth club circuit around Kent. These were important times for our musical awakenings. The bands around at the time were Cream, Hendrix, Jethro Tull, John Mayall and Humble Pie and we were emerging from the blues influenced acts into more artistic song construction which we all started to explore. From the age of your teens to your early twenties is when music is the most important as a soundtrack to your growing years. When I listen to the old albums from my youth they take me straight back there, the first time you got drunk, first girl friend, the first time you made love, the first drug exploration and if you listen to more contemporary acts that have a similar chord progression or sound then you immediately identify with them in an emotionally connect. So if the eighties music was your soundtrack growing up then that's the music you will be emotionally attached to. You can never really argue about which music is best as each person is affected in different ways by it, it would be like arguing about what colour is best. Cheers.